Q. When I opened the file, I do not see the layers. Q. I do not know how to use layered PDF. Q. Patterns are not printed in correct size. Q. I am living in the US and I cannot get A4 size paper easily. Do I have to use A4 size paper? Q. Is there seam allowance included in the patterns? Q. Where is the download link? Q. I would like to sew the patterns but the instruction is only available in Japanese. Could you translate it in English? A. Some patterns indicated “Nested PDF” have all sizes in one layer. Please do not use browser or OS preview function, but use the latest Adobe Reader to open the pattern files. A. Please refer to Adobe website. A. When printing, please make sure to uncheck “Scale to fit” and print at 100%. A. Since letter size paper is shorter than A4 size, there are not enough margins at top and bottom. We recommend using legal size paper. A. Yes, the seam allowance is included in all patterns. You can see the cutting lines (thicker lines) and seam lines (thinner gray lines) on each size in the layer. On the nested patterns (non layered PDF), only the smallest size indicates the seam lines. A. 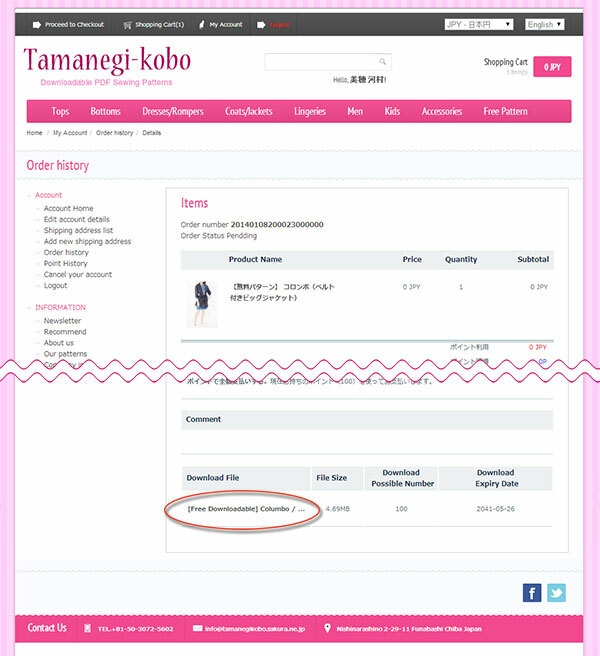 If you would pay with PayPal or credit card, you can download the products from following link ( which is shown on the image). When you would pay through a bank transfer, we would let you know the download address by email as soon as we confirm the payment. A. Please request it from “Inquiries”. Usually it takes about one month to translate.